This Teagle was purchased by Mr. M. Perry of Gillingham in Kent, and registered on 21st May 1955. He ordered it direct from Teagle in Cornwall, and collected it from Gillingham station. It had been fitted to a Federal cycle, purchased by W.T. Teagle Ltd from Co-op Tyesley Works; this was one of the cheapest bicycles available at the time. Despite its cheap price, it was a well-built, large and sturdy bike, suitable for a cyclemotor. It was purchased from this first owner 54 years later by my friend, as a ‘one-owner’ bike. The engine is still in good condition. I received these two pictures of the Teagle when it was on the road 30 years ago. Over the years, the Co-op Federal bicycle had been neglected and now needed a lot of work to make it roadworthy. So instead I decided to fit the Teagle to my 1940’s BSA Gents Regency cycle, which is in excellent original condition, and a very attractive machine. I used a spare mudguard for the rear (because it had to be cut in half to fit the engine) and retained the original BSA one. The engine is sound, but missing its electrics, so we’ve not had it running. This BSA Regency Gent’s bicycle is in good mechanical condition ready to use. It’s cosmetically ‘in its own juice’ as they say in France – ie it’s in sound unrestored condition with its original badges and transfers still showing – just how we like them! UPDATE: My friend Pat, in France, always fancied a Teagle. So this one has now found its way to Paris. He got it running without too much trouble, and reports that he’s enjoying teagling around the Parisian suburbs. 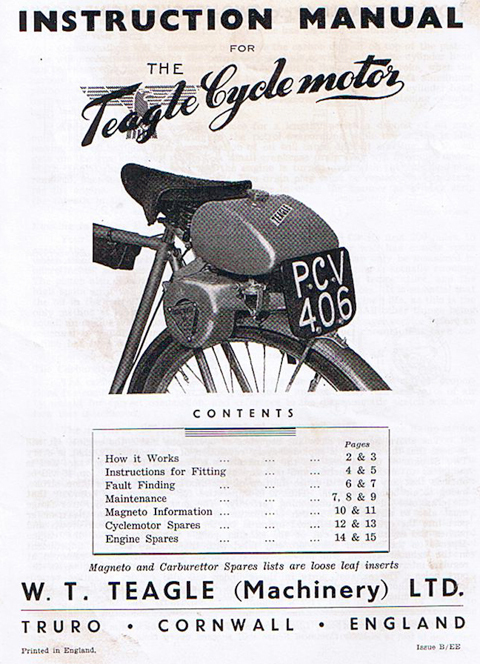 Although now retired for quite a while, I was Designer at Teagle at the time when we used to make petrol engines, approximately 1952 to 1964. Previously I was on the design staff of D Napier and Son, Acton, London on aero engine design, a bit too large for your interest. The firm of Teagle was started by Mr W T Teagle, originally a farmer, and still very energetically concerned with the firm as managing director and also very concerned with the design of new implements. The firm progressed from very humble surroundings to now three factories embodying some of the most modern machine tools and equipment. We produced two basic engines: a two-stroke 50cc and a four-stroke 126cc; both being produced due to necessity, which is the usual reason. The 50cc was designed as part of a manually carried and operated hedge cutter. The unusual feature of having the belt pulley central was for a variety of reasons. It provided the correct balance of the engine in the machine, it enabled an on/off clutch by tightening the belt and it enabled the use of an overhung crankshaft. It also widely spread the crankshaft bearings, a desirable factor. The overhung crankshaft enabled a case-hardened crankpin, the use of a needle roller big end and a lower standard of lubrication, a very necessary feature where farmers were concerned! The crankshaft was made in three parts: the main shaft, web (a stamping home-produced) and a high nickel case-hardened pin. The shaft was welded with the pin under water, thus retaining its hardness. The crankcase & cylinder, cylinder head and cover & cowling were pressure die-cast in high silicon aluminium alloy by an outside firm to our design. The manufacture of this engine was tooled up in a responsible way. For example: the cylinder & crankcase unit was mounted in a machine; all machining, boring, drilling, facing, etc being carried out completely automatically and simultaneously. An unskilled operator loaded and unloaded the casting, going in as a casting and coming out ready for building into an engine in about 30 seconds. This machine was designed and partially made by us. Many thousands of these engines were made, in fact the normal daily output was just over 100 engines. Although originally designed for a hedge cutter, it eventually got used in a motor scyth, lawn mower, motor cultivator and a power pack on a bicycle. They were exported to most countries. The engine, like the four-stroke, was built up to a standard rather than down to a price. When treated properly, these engines have an excellent life, in fact I am constantly using a two-stroke made in 1955; the whole of the engine is original (not like the Irishman’s shovel). As production of the 2-stroke finished in about 1959, we no longer have any spares. The article above was first published in 1984; It was reproduced from the Moped Archive.